Leesho (or Lišo) is a Serbian puzzle consisting of a tower of three or four rotating disks, with 8 square tiles on each disk. Unlike the Whip-it / 6 by 6 or Babylon Tower, which have a space into which a piece can slide, Leesho has no blank space. Instead the front column of tiles is extended over the top cap of the puzzle with four more tiles that connect it to the rear column. 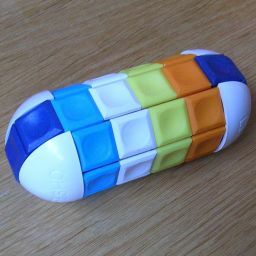 Similarly the bottom of the puzzle has four tiles connecting the front an rear tile columns, forming one long loop of tiles. The tiles in this loop can slide in unison. As the three or four disks rotate, any tile can be brought to the loop in the front (or rear) column. There are 8 tiles of each colour. 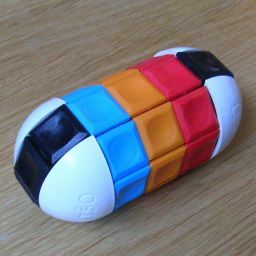 In the solved position, each disk has only one colour. The four tiles on the top and the four on the bottom of the loop are also one colour, usually the darkest of the available colours. This puzzle was patented by Zoran Lišančić - YUP97704 (A), published 17 August 2006. On the 3-disk version there are 32 distinct pieces, 8 of each colour. This gives 32! / 8!4 = 99,561,092,450,391,000 arrangements, and these are all possible to achieve. There are however 4! = 24 solutions because it does not really matter which colour goes to which disk. The 4-disk version has 40 distinct pieces, 8 of each colour, so it has 40! / 8!5 = 7,656,714,453,153,197,981,835,000 positions, this time with 5! = 120 solutions. Hold the puzzle vertically, with the loop going through the front column of tiles. Mentally number the disks from top to bottom 1, 2, 3, and possibly 4. Shifting disk 3 to the left by one tile will be denoted L3, and to the right R3. Similarly the other disks. I will also use U to denote shifting the front column upwards by one tile, and D shifting it downwards. Phase 1: Solve the outer ends of the loop. Decide which colour the outer tiles should have. If you see some easy moves that place some of the tiles of that colour on the caps, then do them. Hold the puzzle so that one of the two tiles at the front of the top cap is of the wrong colour. Find the topmost disk containing a tile that belongs on the caps. Rotate the disk to bring that tile to the front. Repeat this step until the tile is in disk 1. Repeat steps b-e until both caps are completely solved. Decide which colour each disk should have. Repeat step b until disks are completely solved.